A number of distressed and dead turtles were found by canoeists in the Bellinger River on the north coast of New South Wales on Wednesday February 18 this year. At that time, it was reported by NSW National Parks and Wildlife rangers, NSW Wildlife Information, Rescue and Education Service (WIRES) volunteers and local residents that 30 turtles were affected. Several days later, the tally increased to 52 and, as of today, more than 300 turtles are dead. But the real toll is far greater, with many more washed away during a flood in late February. Yet the peril of this one turtle species is more than an isolated issue. It gives us a window into the health of the entire ecosystem around the Bellinger River, and suggests something is very wrong. The dead turtles are all from one species, the Bellinger River Snapping Turtle (Myuchelys georgesi), which is a species that only exists in a 25-kilometre stretch of the Bellinger River. The risk of extinction is high. National parks have been closed indefinitely and plans are in place to recover healthy turtles from the wild. There are already few juvenile turtles in any Australian river because of sustained annual fox predation, close to 100%. So the reality is that, even with active management, recovery of the species will take more than a decade if the current disease doesn’t wipe them out. Ill turtles display symptoms of blindness, growths around the eye (septicemic cutaneous ulcerative disease, or SCUDs) and are extremely lethargic and emaciated. The mortality rate of infected animals is 100%. High mortality combined with an extremely limited range means that this is quite possibly a rapid extinction event. Turtles are an evolutionary success story, having persisted for over 220 million years. Australian freshwater turtles face many threats that permeate every life-history stage, from egg to adult. The life history of turtles involves high but fluctuating rates of egg and juvenile mortality, which is balanced by extreme iteroparity (i.e. they are long-lived and highly fecund). Threats to adults are generally low. Human activities have impacted this successful life strategy by increasing mortality of eggs and young, as well as adults. Nest predation rates are extraordinary high and adult turtles frequently become victims of road kill or are killed by foxes as they emerge to nest or disperse. […] a combination of human-induced changes has created a downward spiral so powerful that – without strategic intervention – much of the great turtle lineage will have disappeared by the close of the 21st century. The possible extinction of an ancient lineage and iconic animal is tragic, but the consequences for the health of our rivers are even more significant. In most systems, turtles rival fish as the highest vertebrate biomass. They are the major vertebrate nutrient recyclers (i.e. scavengers), a significant herbivore and the top predator. Scavengers serve an important function by stabilising food webs and are critical in redistributing nutrients. Thus turtles provide a critical ecosystem service by removing decaying animal matter from the environment. Significant numbers of dead turtles are symptomatic of something wrong with a river or wetland. Given their various roles in an ecosystem, indicators of biological health don’t come much better than freshwater turtles. The Bellinger River Snapping Turtle consumes food, such as insect larvae, that are highly sensitive to pollution, increased sedimentation or general water conditions. In a river, which changes almost daily because of rainfall, insect populations respond rapidly and are affected by natural changes. The turtle is adapted to boom-bust cycles of the river and resilient to natural shortages of food. However, if there are chronic issues with the food supply, then turtles will be impacted. The crisis with the turtles in the Bellinger River may signal broader effects of a change or breakdown in ecosystem function in the river. 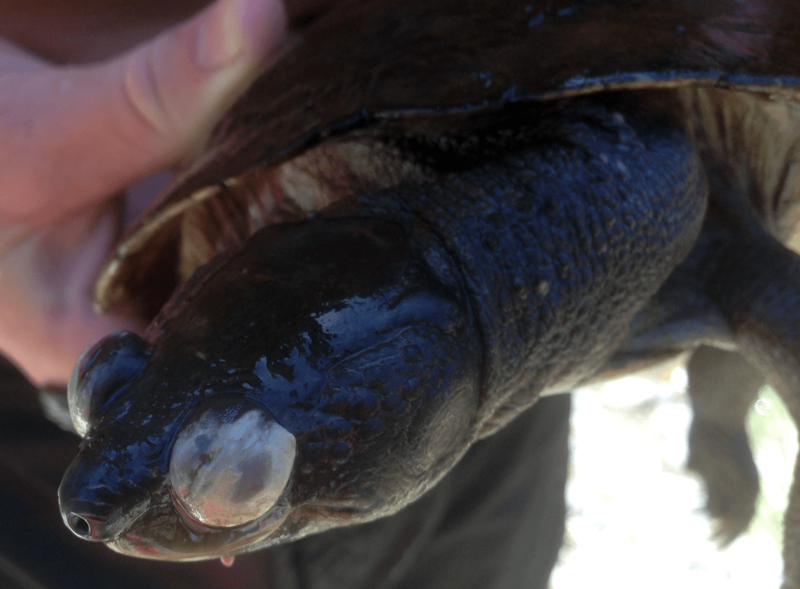 The last mass freshwater turtle mortality event occurred in the lower lakes of South Australia during the millennium drought, when salinity levels rose and many turtles perished after becoming entrapped by growths of marine tubeworms on their shells. 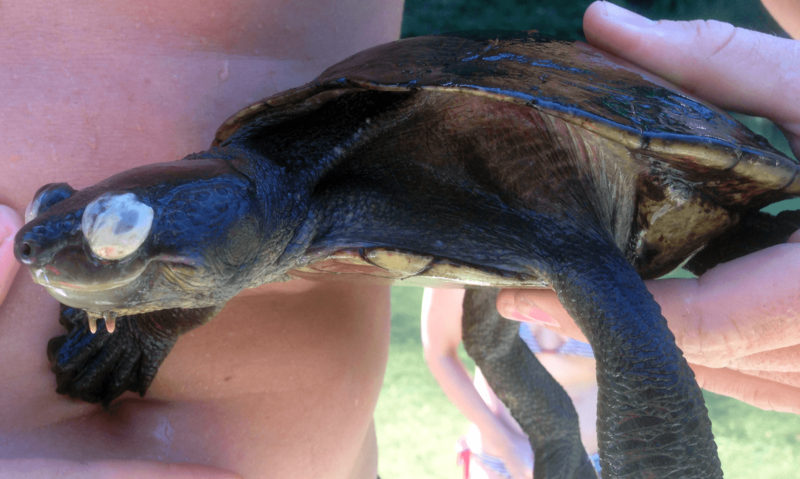 The value of turtles as indicators of aquatic ecosystem health is that their health relates to medium to long-term changes in the river, rather than annual or seasonal fluctuations that occur in potentially environmentally volatile systems. They are also long-lived and turtles can bio-accumulate toxins in their shells. Regular sampling (shell or nails) of marked individuals can be used to monitor long-term exposure to toxins and pollutants in the river – something that snapshot monitoring of water quality may miss. Turtles are threatened by chronic reproductive failure, exotic predators, disease, habitat modification and habitat loss. Potential for any recovery is limited by ongoing threats and limited capacity for populations to increase. The current disease threatening to drive the Bellinger River Snapping Turtle to extinction is a potential window into a long-term breakdown of ecosystem services. The possible extinction of a long-lived ancient species that has survived several million years might be a significant warning sign of the current state of our freshwater environments.